There’s still a month left to see our current Exhibit, by renowned painter Erv Lewandowski, in person. Erv’s coloured paintings were selected for two shows in February. “Falling Water VII” by artist E.P. Lewandowski was selected by Gallery 25N and ART-CONNECTIONS.net for the “Blue” Online Gallery Exhibition. The exhibit features 15 international artists from China, Taiwan, Spain, Romania, Iran, USA, Canada, and Australia. “Falling Water XVI” by artist E.P. 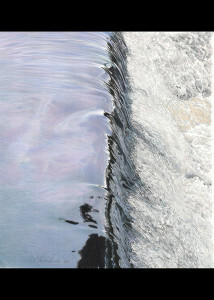 Lewandowski received the Award for Distinction from the Colored Pencil Society of America Explore This! 12 Competition. A high for me is viewing artwork that appeals to my creative side. Every artist aspires to find that unique subject that excites the soul, inspires the creative process, and challenges his or her skills. 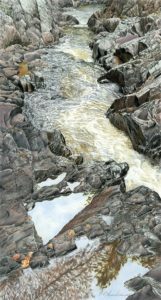 I was fortunate to discover a comfortable venue with waterscapes a number of years ago. This area of interest is priceless, ever-changing, and available throughout the world. The culinary world has a special appeal to me. I love to cook, and find food preparation one of several interests that keeps my creative side challenged on a daily basis; especially, after drawing sessions. Accounting is a necessary evil in life for an artist. As a college student, I was influenced by a number of gifted artists from KATHE KOLLWITZ [GERMAN ARTIST], to Alan Magee [professional illustrator], and to Picasso [e.g. early drawings]. Today I find pleasure in knowing and enjoying the artwork of professional artists like ELIZABETH TYLER [WATERCOLORIST/ACRYLIC PAINTER], Abe Toshiyuki [watercolorist], Angus McEwan [watercolorist], Kolbjorn Haseth [watercolorist/acrylic painter], and a number of gifted men and women in the Colored Pencil Society of America, Pencil Art Society of Canada, and International Guild of Realism. I draw for a living and consider graphite pencils, Prismacolor colored pencils, and pigment ink liners to be my tools of interest. Color. I find color to be a challenging experience with every creative endeavor. I enjoy the music of several talented men and women. The top of my list includes pianists JOHN FLUKER, Jim Chappell, and Wayne Gratz. I had the good fortune of studying art at Central Michigan University with several very talented men and women instructors in the early 70’s. Thank you to Erv for answering our questions. I always learn something about them and the artists/musicians that appeal to them, helping me grow as an artist, too.